The gills of fishes are very efficient at extracting oxygenfrom the water because of the large surface area and thinepithelial membranes of the secondary lamellae. The gills of fishes are very efficient at extracting oxygen from the water because of the large surface area and thin epithelial membranes of the secondary lamellae (Fig. 5.1).Diffusion of gases across the gill membrane is further enhanced by blood in the secondary lamellae flowing inthe opposite direction to the water passing over the gills, thereby maximizing the diffusion gradient across the entire lamellar surface. This countercurrent flow ensures that as the blood picks up oxygen from the water it moves along the exchange surface to an area where the adjacent water has an even higher oxygen concentration. Gills will function efficiently only if water is kept moving across them in the same direction, from anterior to posterior. This is accomplished in one of two ways. First, the great majority of fishes pump water across their gills by increasing and decreasing the volume of the buccal(mouth) chamber in front of the gills and the opercula chamber behind them. The expansion and contraction of these two chambers is timed so that the pressure in the buccal chamber is greater than the pressure in the opercula chamber, thereby ensuring that the water flows in theanterior to posterior direction throughout the breathing cycle (Fig. 5.2). 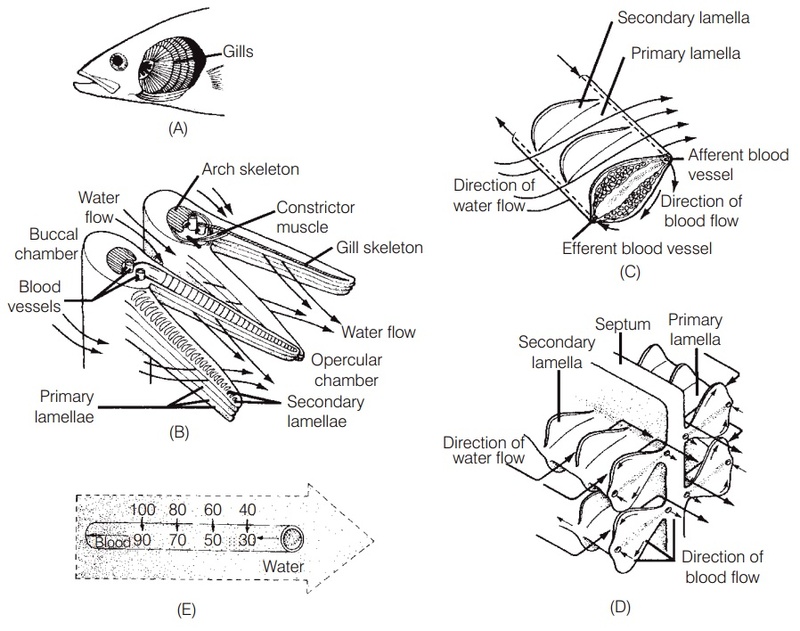 (A, B) The gill arches of a fish support the gill filaments (also called the primary lamellae)and form a curtain through which water passes as it moves from the buccal cavity to the opercular cavity. (C) As water flows across the filaments of a teleost, blood flows through the secondary lamellae in the opposite direction. (D) In elasmobranchs, even thoughsepta create some structural differences in gill filaments, water flow across the secondary lamellae is still countercurrent to blood flow. (E) The countercurrent flow of water and blood at the exchange surface of the secondary lamellae ensures that the partial pressure of oxygen in the water always exceeds that of the blood, thereby maximizing the efficiency of oxygen diffusion into the blood. A second method of gill ventilation, called ram ventilation, consists simply of keeping the mouth slightly open while swimming. The forward movement of the fish keeps water flowing over the gills. This is an efficient way to ventilate the gills because the work of ventilation is accomplished by the swimming muscles, but it can only be used by strong swimmers while they are moving at relatively high speeds. Some predatory pelagic fishes, such as tunas(Scombridae), rely exclusively on ram ventilation and must therefore swim constantly. It had been thought that sharks also had to swim constantly in order to breathe. However, observations of so-called “sleeping” sharks on the ocean floor, including relatively sedentary species such as Whitetip Reef Sharks and Nurse Sharks, indicate they too use a gill pumping mechanism similar to the one described above for teleost’s. Many larger fishes use ram ventilation while swimming at moderate to high speeds, but rely on pumping ofthe buccal and opercular chambers while still or moving slowly. As speed increases they can switch from gill pumping to ram ventilation (Roberts 1975a). The timing of the expansion and contraction of the buccal (oral) and opercular cavities ensures that the pressure in the buccal chamber exceeds that of the opercular chamber throughout nearly all ofthe respiratory cycle. This creates a nearly steady flow of water from the buccal chamber to theopercular chamber, passing over the gill lamellae, which have blood flowing through them in the opposite direction. The fish is viewed from below. Adapted from Hildebrand (1988). The total surface area of the gills is considerable and active fishes with higher metabolic demands generally have larger gill surface areas than less active fishes. For example, Skipjack Tuna are active pelagic predators and have about13 cm2 of gill area per gram of body weight (Roberts1975b). Scup (Sparidae) are nearshore, active fish and have about 5 cm2/g. Benthic, yet active, plaice (Pleuronectidae)have a little over 4 cm2/g, whereas the sluggish, benthic Oyster Toadfish (Batrachoididae) has about 2 cm2/g. Fishes with large gill areas control how much of the gills are receiving blood at any given time by constricting or dilating blood vessels in the gill filaments (see Jones & Randall1978). Agnathans have a very different gill structure and rely on different means of ventilation. Hagfishes (Myxinidae)have a muscular, scroll-like flap known as a velum which moves water in through the single median nostril and over the gills (Fig. 5.3). When the hagfish’s head is buried in food, water enters and leaves the gill area via the external opening behind the last gill pouch. Lampreys(Petromyzontidae) expand and contract the branchial area causing water to flow in and out through the multiple gill openings. This method of ventilation is especially practical when the lamprey’s buccal funnel is attached to the substrate or a host organism. (A) Hagfishes have one or more external gill openings on each side. Movement of the scroll-like velum draws water in through the nostril and pushes it through the pharynx and branchial pouches. Excurrent branchial ducts then direct the water to the gill openings. (B) Lampreys have multiple external gill openings on each side. Expansion and contraction of the branchial pouches provides ventilation through each external opening. This permits continued breathing while the mouth is attached to substrate or a host. Although gills typically are identified as the respiratory organ of most fishes, any thin surface in contact with the respiratory medium is a potential site of gas exchange. Gas exchange across the skin (cutaneous respiration) can be important to some fishes, particularly in young fish whose gills have not yet developed fully. Newly hatched alevins of Chinook Salmon (Salmonidae) rely on cutaneous respiration for up to 84% of their oxygen (Rombough & Ure1991). As the fish develop and their gills increase in size and efficiency, dependence on cutaneous respiration decreases to about 30% of total uptake in the fry and later stages. Adult eel (Anguillidae), plaice, reed fish (Polypteridae),and mudskipper (Gobiidae) gain about 30% or more of their oxygen through their skin (Feder & Burggren1985; Rombough & Ure 1991).